Comm Eye Health Vol. 31 No. 101 2018 pp 27. Published online 23 May 2018. 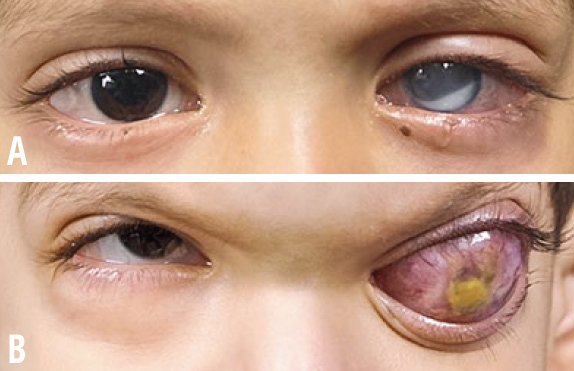 A 2-year-old male is brought by his parents.The history is that a white reflex was noted in the eye several months ago. The eye has now become red and painful (A). The patient is then lost to follow-up and comes back 6 months later with proptosis and frontal bossing (B). 2. How will you confirm extent of disease? 3. What is the treatment of choice for the left eye?